narrated by Emily Janice Card 9h. 3m. I don’t believe I’ve ever read a dystopian novel in which the emotional content is quite so interwoven with the sci-fi aspect. 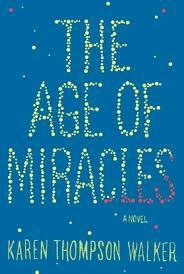 In Walker’s debut novel she manages to incorporate the effect of the earth’s slowing of the earth’s rotation (entropy?) with the lives and loves of a 12-year old girl and her friends, family, neighbors and acquaintances. A combination dystopian sci-fi and coming-of-age story with a 12-year old 1st person who wonders about her father, a boy in school, the slowing, her mother, her friends, and her grandfather. Meanwhile the days get longer and longer – 24 1/2 hours , 26 hours, 30 hours, more. To use clocks or not? How does this affect the crops, the birds, the oceans, personal health and relationships? This is a very imaginative expansion on that idea. This reads like Young Adult fiction but I’d say yes for over the age of 15 due to content. Have you read Earth Abides by George R. Stewart? I think it’s a wonderful emotional science fiction novel. I think The Lovely Bones was the success it was because it combined the personal, emotion and fantasy all into one story. I love a great first person novel that has a distinctive voice.